But one fall day in 1995, Libby was applying his skill with numbers differently. We were driving south on the Interstate in his pickup truck, on our way to Boston for a first-of-its-kind Northeast Food System Leadership Congress, and Libby was checking license plates to see if he knew any drivers. To my amazement, he twice predicted who we would see behind the wheel, based solely on his memory of plate numbers. This was the kind of parlor trick that could only work in a place like Maine, where people you know are likely to be driving the highway with you, but I was impressed Libby could do it at all. I took this as a sign that he was the right kind of person to tackle the seemingly impossible. Good thing, too—because for most people back in 1995, the idea of revitalizing farming in Maine seemed impossible. Libby and I were committed to farming’s future. 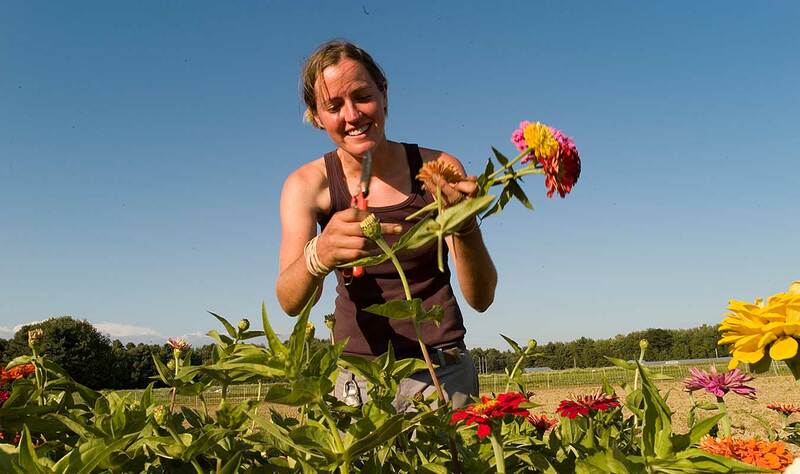 At the time, Libby was the new executive director of the Maine Organic Farmers and Gardeners Association (MOFGA), and I had recently launched the Maine Farms Project at Coastal Enterprises Incorporated (CEI). We knew how farms in Maine had declined in the last generation; yet we firmly believed that farming here could grow. We were inspired by organic innovator Eliot Coleman, chef Sam Hayward, and other Mainers who were leaders in a national movement advancing local food; we were impressed by all the Maine farmers doing their part on the ground. And now we were off to Boston to dream and plan with peers from other states. Fast-forward to today and you can see the difference. It’s now commonplace for Mainers to shop at farmers markets, participate in CSAs, and seek out local produce at stores and restaurants. Parents push school boards to incorporate local farm products into school lunches. State and local officials who once scoffed at the very idea of farms as viable businesses now promote farming as smart economic development. Candidates for governor talk about how Maine can be the food basket of the Northeast. The statistics support this optimism: From 2002 to 2012, the number of farms in Maine grew by 13.5 percent. 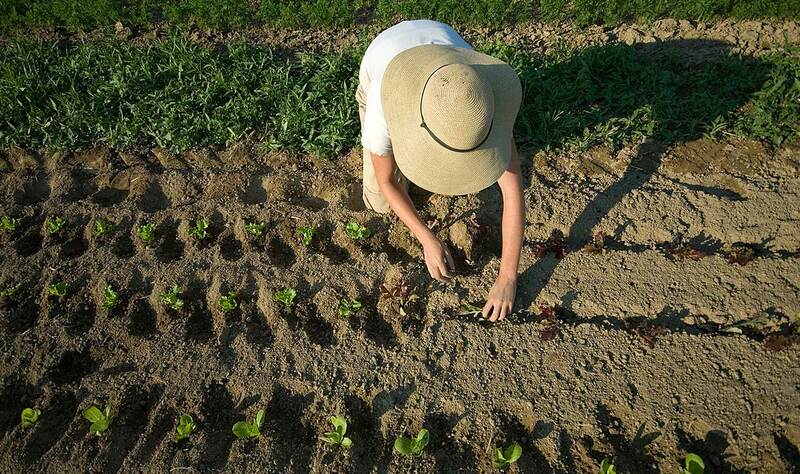 From just 2007 to 2012, the value of Maine’s farm production increased by 24 percent. During that same period, the number of young farmers (under age 34) in Maine soared, up nearly 40 percent. That’s the question addressed by Brian Donahue of Brandeis University, who assembled a team of researchers (including Libby) to explore how much of the food that New England eats could be supplied locally—given population trends, dietary habits, climatic conditions, and land availability. The resulting just-released report, A New England Food Vision, shows how the region could, by 2060, produce half to two-thirds of all its food (meat, fish, dairy, vegetables, fruit, grain, sweeteners, oils, and beverages), up from about 10 percent today. Doing so could yield significant economic, environmental, and social benefits throughout the region, but would require a major ramp-up in the amount of New England that is farmed: from 2 million acres today to 6 million acres or more by 2060. A good chunk of that land would need to come from Maine. This vision is promising and possible, yet not supported by today’s economic realities. Maine has the needed land, yet cannot cultivate another million acres (let alone another 3 million acres) without also cultivating new markets. While there is great and growing demand for food produced close to home, there is not yet sufficient demand for that much local food at prices that work for farmers. That’s the nut that needs cracking. Some people say that local food costs too much. A fairer statement may be that a lot of the food brought here ‘from away’ costs too little. Consider, for instance, how fruits and vegetables grown in California rely on water systems—and come east via transportation systems—built and maintained with government funds. Consider, also, how the transporters pay less for fuel than its true cost. At present, some fruits and vegetables grown in Maine are cost-competitive with food from away and some are not. (It depends on the crop and time of year.) But more Maine food would become cost-competitive, if more of the true cost of producing and transporting food was incorporated into its price. Some people say that local food costs too much. A fairer statement may be that a lot of the food brought here ‘from away’ costs too little. We can take steps to reduce the relative cost of Maine farm products by helping smaller farms scale up. In the last decade, we’ve seen rapid growth in small, diversified farms that sell directly through farmers markets, farm stands, and CSAs. Some of these farms now want to expand modestly, to increase efficiency and be able to sell at least some products wholesale. That’s good news if we are serious about getting more Mainers to eat locally, because the majority of consumers are going to get most of their food from supermarkets and institutions (entities that principally buy wholesale), not from direct retail venues like farmers markets. Many small farms are now exploring various ways to enter wholesale markets, including participating in ‘food hubs’ that pool products from multiple farms. These hubs—which come in many forms—begin to re-create the community-scale infrastructure that once existed throughout Maine, back when small canneries, creameries, and slaughterhouses were common. Maine farms will also become more competitive with changes to federal policy. With a new farm bill just passed, major reform is not coming soon; but reform will come, because the public will demand it. Awareness has now grown to a point where it will not be suppressed, spread as it has on so many levels, from author Michael Pollan to the local farmer who interacts with attentive customers. Beyond what may happen in Maine or Washington, D.C., we are witnessing larger forces at work in this direction. The relative cost of food from away is slowly but methodically rising, driven ever upwards by numerous factors, including increasing fuel costs, more frequent droughts and crop-damaging storms, and the alarming depletion of the Ogallala Aquifer (which supplies 30 percent of the groundwater used for irrigation in the United States). There’s no question that the economic realities in place a generation from now will bolster the competitive position of Maine farms and support the kind of robust local food system advanced by A New England Food Vision. But what happens between now and then? What happens in the interim, when the most profitable use of a 10-acre parcel with prime farm soils is to drop a new house in the middle of it, with no regard for that land’s potential to feed us? What happens when current market forces do not reward farmers adequately? 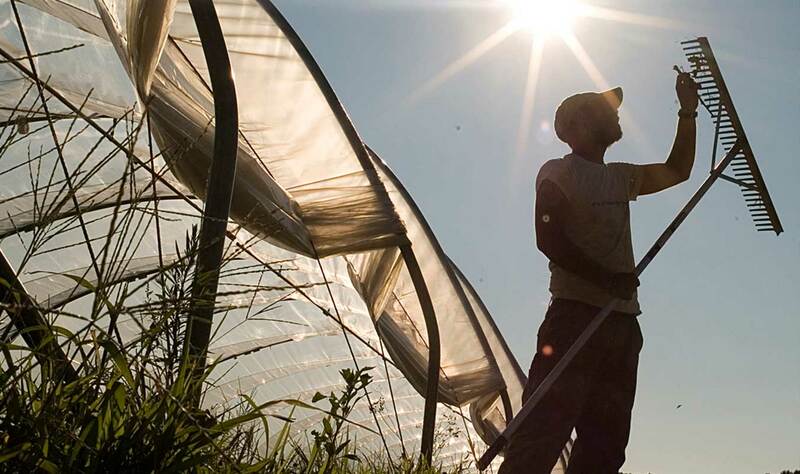 What happens when new farmers cannot afford to buy transitioning farmland? If—during this critical time—we lose much more land to short-sighted development, or if we lose farming know-how because we aren’t helping existing farmers remain in business or new farmers get started, then farming here will never realize its promise. For close to 20 years, I’ve been an unabashed supporter of farming in Maine, talking up the future whenever I can. I’m still doing that. But now— amid all the excitement about farming—I make a point of stressing that not all economic forces lead in the right direction. The future we want will only be realized if we take deliberate steps to protect more farmland and provide key services to farmers—and only if we do so now, while we still have the opportunity. 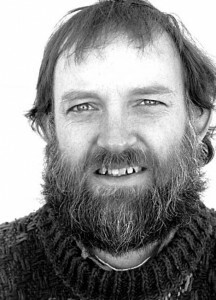 When Russell Libby passed away in late 2012, many of us lost a dear friend and colleague who we relied upon for so much. In my case, I also lost someone I could talk to about the numbers. Numbers are important: they frame what’s possible. In the 1880s, Maine farmed 6.5 million acres. Today, the figure is about 700,000 acres. Of the remaining 5.8 million acres, only about a million acres have been lost to development. Much of what’s left has grown up in alder and pasture pine. 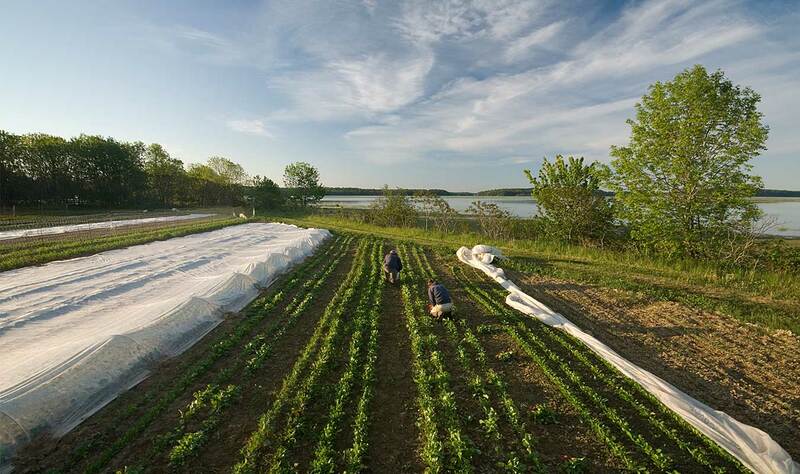 With the right steps, that land could transform farming in Maine. In winter 2009, Libby and I attended a gathering of farmers and researchers at Spannocchia, a farm in Tuscany, where my roommate was Brian Donahue and where I—as always—talked up Maine. At first, Donahue was skeptical that Maine had the potential to feed so much of New England, but that changed the more he spoke with Libby, who held in his head all the numbers needed to make the case. “Let’s look at this closer” they said—and A New England Food Vision was conceived. Yes, Maine could once again feed itself and more. But just because this could happen, doesn’t mean that it will. The future of farming here hinges on what we do now. It’s time for the people of Maine to build an expansive and enduring terrace, a foundation worthy of who we are, and then upon it, tend a bountiful garden.